When the 2009 protests across Tehran failed to overthrow the political dictatorship that had dominated Iran for over 40 years, there were of course repercussions to be made, especially in the liberal filmmaking community. Abbas Kiarostami has all but fled his native country, now making films outside of his state. Mohsen Makhmalbaf abandoned filmmaking to become a full time revolutionary. 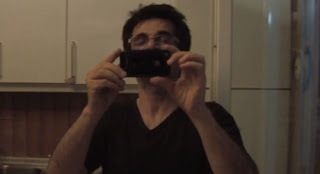 And Jafar Panahi, perhaps the most political filmmaker of the country, was banned from being a filmmaker for 20 years. And thus, Mr. Panahi, along with a conspirator, the documentarian Mojtaba Mirtahmasb, have made a fascinating experiment in what they consider non-cinema. Or is it? That’s the point of This Is Not A Film, a direct allegory of cinema as political statement. Its mere existence might lead to Mr. Panahi’s immediate arrest, but it is a bold work that questions not only the absurdity of the politics of Iran, but the nature of what defines film. As the experiment opens, we see Mr. Panahi eating breakfast, putting on clothes for the day, and calling a few friends. He is taking a camera around with him, but does he believe it is for the purpose of a film? Is his decision to put his calls on speakerphone, so the camera can pick up the audio, a directorial choice or simply an every day choice? Stuck under house arrest, Mr. Panahi has no choice but to live his life in this absurd way. Eventually Mr. Mirtahmasb takes over the camera, and the two chat about his arrest. Mr. Panahi decides to perform an experiment, by explaining the last film he attempted to make. The script was rejected by the Iranian Film Commission, so Mr. Panahi decides that he will explain the script. 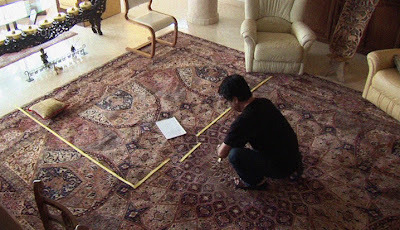 Using his living room, he uses tape to show boundaries, explains where the camera will be placed for each shot, and reads some of the dialogue aloud. It’s a fascinating experience to see Mr. Panahi’s directorial process at work, but almost more fascinating is the moment he forces himself to stop, unable to take the pain of not being able to do his life’s work. Shot over the course of a day in early March, This Is Not A Film is a brief (75 minutes) but fascinating political statement (the film only made it to the Cannes Film Festival by being smuggled inside a USB stick hidden inside a cake). Mr. Panahi and Mr. Mitrahmasb aren’t exactly sure of what to do, but they keep the cameras rolling because they are compelled to do something to defy this absurd ruling. 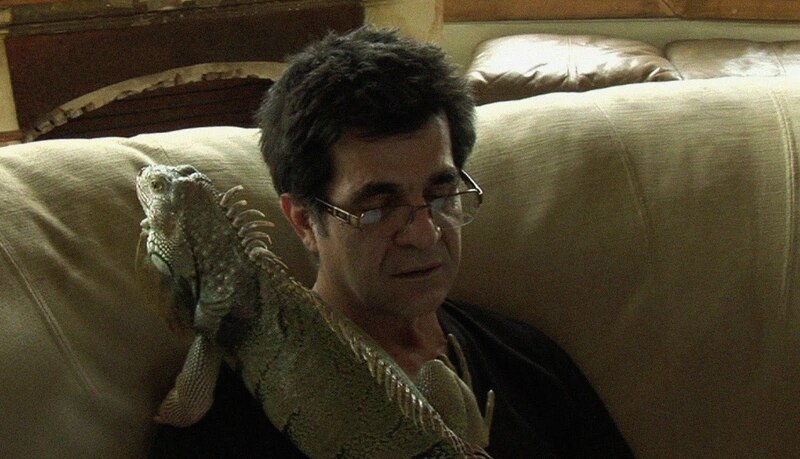 Sometimes this allows the film to be somewhat tangential in absurd ways, such as Mr. Panahi’s interactions with his pet lizard or his discussions of his own choices as a filmmaker as he shows clips from his other films (an astute observer behind me mentioned that the Ryan Reynolds trapped in a coffin film Buried appeared on his DVD shelf, claiming it can’t be a coincidence). We often talk about how some of the greatest films of all time have come out of great limitations from circumstances beyond the director’s control, and the greatness derives from the filmmaker’s attempts to work around those circumstances. This Is Not a Film is perhaps the most limited film, precisely because the director can’t direct (a running joke occurs when Mr. Panahi calls cut and Mr. Mitrahmasb refuses). The result is so minor in its aspirations, but so powerful in its accomplishments. This is an absurd work where each frame on screen, through its mere existence, is a direct political statement against a terrible regime. Labels: film theory, iran, jafar panahi, mojtaba mirtahmasb, nyff, nyff49, political films, reviews, this is not a film, what is cinema?